It features goat milk from Left Foot Farm, delicious goat and sheep milk cheeses, and locally farmed dried tomatoes and spinach. The delicious sun-drenched flavors of the Mediterranean are the inspiration for this “no moo” MeltMac. Made with real Greek Kasseri, Mizithra, a ‘ewe’-phoric Gouda, Kalamata olives, dried tomatoes and spinach; one bite will transport you to the beaches of the Greek Islands. Kali Orexi! If some of these ingredients are new to you, stop by to ask for a taste and explanation of all of those wonderful names. Wild-harvested, and fresh as a Gift from Mother Nature can be. Photo courtesy Hama Hama Oysters. Better get these wild-caught prawns while they are here at Ballard Farmers Market. We never know when or how long they’ll be available. 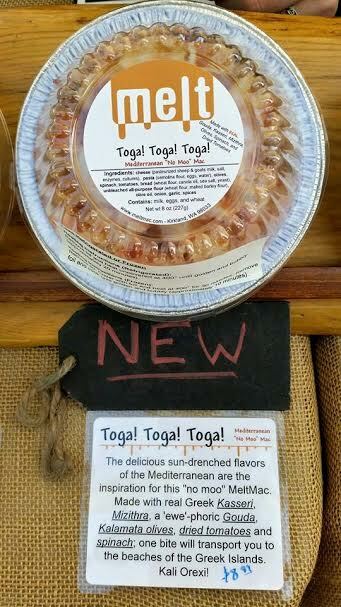 A delicate and unique flavor treat, easy to prepare, and absolutely delicious. 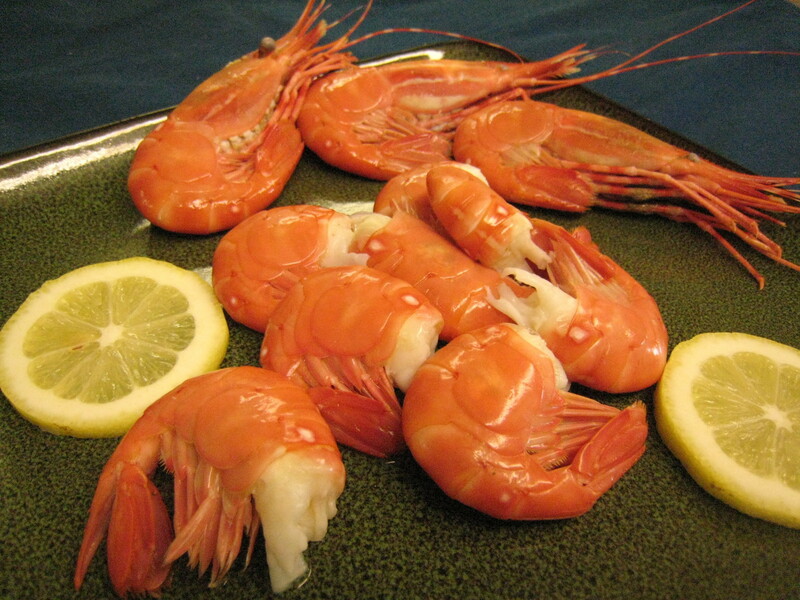 EASY RECIPE FOR SPOT PRAWNS DINNER: Start a 2-4 quart pan of heavily salted water to boil. Coat a pretty large pan with a good dash of olive oil, add smashed garlic and gradually bring heat up to medium-high. Wash prawns in fresh, cold water as the fry pan gets hot, pat-dry prawns. When water is boiling fast, add Pasteria Lucchese’s Tagliatelli, (or any favorite pasta). Stir pasta as water starts to show bubbles again. Add spears of asparagus or bok choy into the water as the pasta finishes. This is when you need to watch all the cooking pots because it takes only a short time for everything to be cooked perfectly. Add prawns into garlic saute pan, stir until they turn red, it will be just a few minutes. Use tongs to remove veggies from pasta, drain pasta by pouring through a colander. Plate pasta, pour spot prawns over pasta, including the garlic-oil, add asparagus. Serve and get rave reviews. NOTE: When eating everybody should use their fingers and tongues. Lick the prawns for a great flavor burst, then peel the prawns, bite, eat pasta, eat vegetables, enjoy. Cascade Bicycle Club has worked to develop a bike rack valet parking program for the community of Ballard Farmers Market. It will be premiered this Sunday. Come by the market and check it out. We are so excited to be able to offer a safe place at the market for all our biking friends to stash their bikes while they shop at the market. 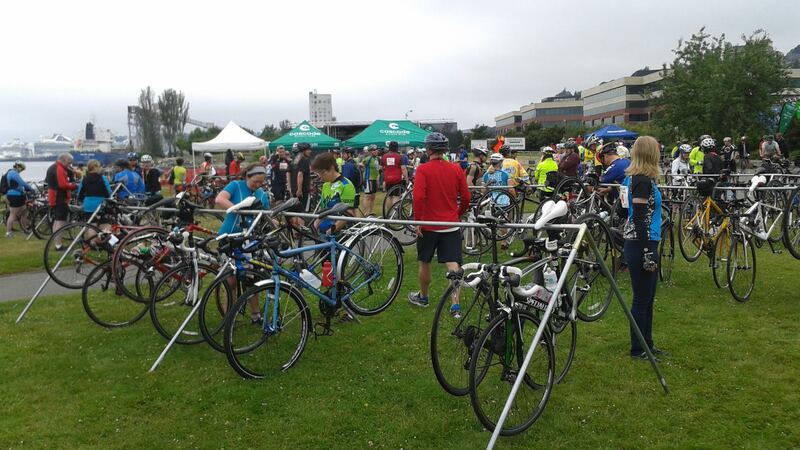 Thanks go to Cascade Bicycle Club for thinking of Ballard Farmers Market as the place for this and for their generous donation of time and efforts to make it happen. And we want to give a shout out to Second Ascent for providing the storage of the bike rack during the week. The support from this neighborhood is so awesome. This is an idea announced 45 years ago today, here in Seattle. It’s one of our City’s gifts to the world. Originally celebrated by delivering a black casket, symbolically containing the Earth, to the Mayor’s offices. Don’t we live in an amazing, special and beautiful place? Sustainable Ballard is having a Street Party this afternoon, April 22nd, 4 pm until 8 pm at NW 46th Street & Leary Way NW. There will be lots of ideas for improving our environment, music, great food and interesting people. You’ll also find out that it can be fun to work on improving our world. Go to the Earth Day Network website and see ways you and your family can have an impact on what is going on. If we stand up for our community and use our dollars to speak of what we feel is important, we can make a difference. This is, no doubt, something that you already know. Read the April 15th Forbes article, “Earth Day 2015: …10 Funds Prove Investors Can Beat The Stockmarket by Going Green”, written by Tran Ho, an investment consultant. Click on the Forbes name and find out how beneficial it can also be to be thoughtful and principled when you use your money. 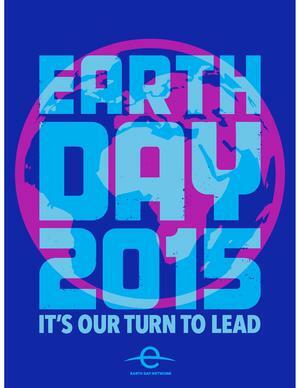 The message on this 45th anniversary of Earth Day is don’t be shy to contact your politicians. Be they working downtown, in Olympia or in the Other Washington. Tell them what you feel is important. And keep doing it. They don’t act like they can hear, or read, but perseverance is the key. Our efforts can contribute to a ripple effect that leads to policies that will protect this wonderful world. I understand that snail mail is now taking too long to get to some of the politicians because of security checks. So feel free, and be counted, by sending an email about what matters to you. If you need to get the email addresses, we’ll be glad to help you find that. Finally, don’t forget to vote. 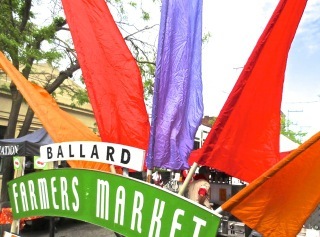 As Ballard Farmers Market supporters, you commit positive actions (on many levels) to support local food producers. Earth Day is every day for you. In a real way, you contribute to our state’s smaller-scale farm families in an enterprise that is more difficult than ever for anyone not doing large-scale agriculture. Because of you, the Ballard Farmers Market, like the other farmers markets in our community, has become an economic engine for our State. The people who prepare foods ready to eat at the market and those who grow and craft the wonderful items you take home, also buy their ingredients directly from the farms and local businesses. Along with you, we are part of an elegant architecture of mutual community benefit, while eating the finest foods to be found anywhere. With your support, for the last 3 years, we’ve been able to offer more of our neighbors the ability to use their SNAP (food stamp) benefits at the market. Striving to bring the finest we have to all who want it. Every time you buy something from our small businesses, of whatever type, there is an economic phenomenon called the “Multiplier Effect”. This term originated from economics related to savings, but has recently been used by the USDA to describe the effects of direct marketing benefits for small farms and farmers markets’ communities. It deals with the fact that a dollar spent at a market, given to a farmer, is re-spent by that farmer with 72-89 cents going back again into the local economy, and this effect can often happen repeatedly. Your actions contribute in real terms to the wonderful community we have. Without you, we could not do it. We are proud and grateful that you spend your time and dollars with us. Finally we can see the babies! 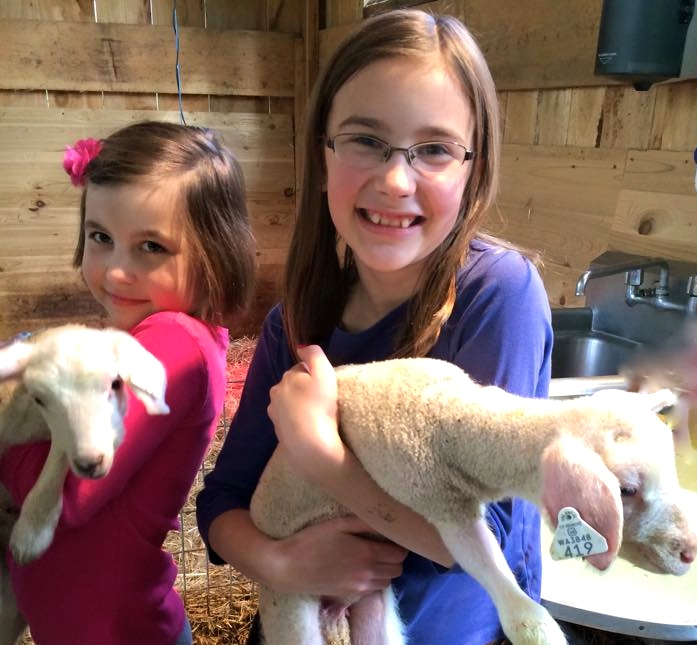 Born in February, they are just now getting the chance to explore outside of their barn. Aren’t they beautiful? And their mommas are getting back into production. 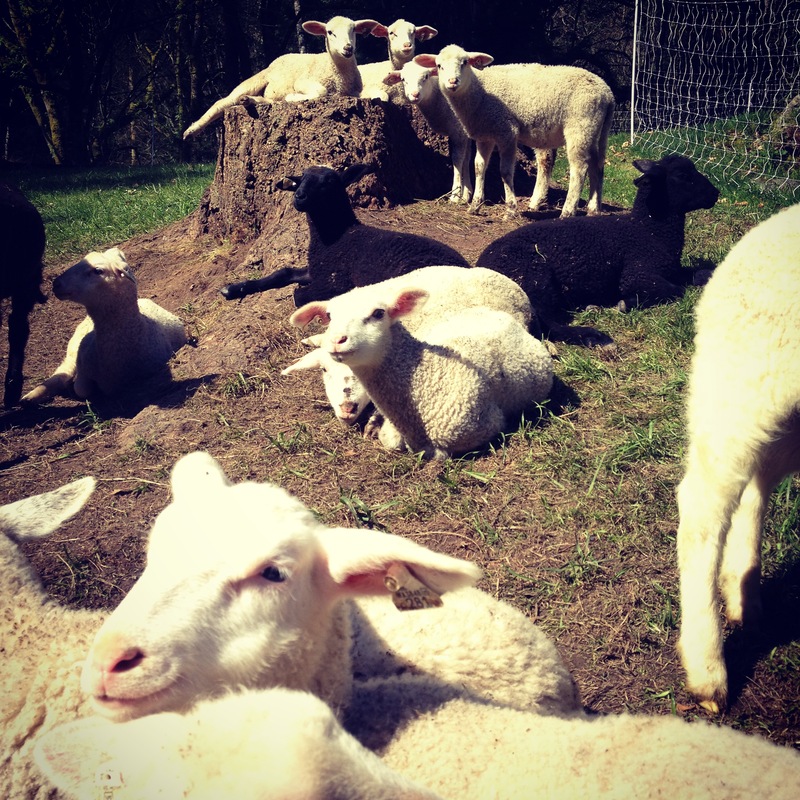 Pick up a jar of some of the best tasting Sheep Yogurt that you’ve ever tasted, and handcrafted farmstead Sheep’s cheese this Sunday at Ballard Farmers Market. Growing Washington Farm has some of the first green garlic.Copyright Zachary D. Lyons. 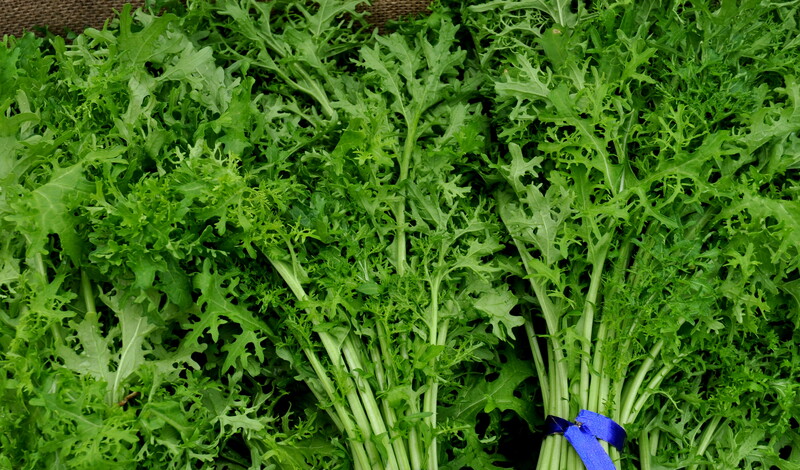 2 Bunches Mustard Greens and a handful of Pea Shoots for each person. Wash and spin dry (or wrap in a clean towel for 15 minutes), pile leaves on top of each other and slice lengthwise, 2-3 times. Heat oil to medium high (the oil will start to shimmer) in wok or frypan. Add onion and a dash of salt and let sizzle for 3 minutes or until they start to show some brown. Add chopped greens, pepper and the rest of the salt. Stir every minute or so until greens are bright and shiny, 3-6 minutes. You can also add tofu ( I like to marinate the firm-type while I’m starting rice and chopping things). Then I add it to the pan with the onions. Beans are another great idea, and really quick if opening a can. Of course, you can add some type of meat, like savory sausage, or stir fry cuts. An Example: If you buy leafy greens at Ballard Farmers Market, they will stay fresh in your fridge for 5-8 days, a couple of days more than if you go to a grocery store for your greens. But we all know sometimes it doesn’t work out to get to them by that time, and they can start looking a little limp. Easy Fix: soak them in a bowl of very cold water for about 30-45 minutes. They’ll perk right up for you. Spin them dry & they’ll keep another 3-5 days in a clean plastic bag in your veg drawer. But if you don’t plan to cook the 2nd half of the bunch of greens after a week, store the remaining bunch in your freezer. It won’t take but a few minutes. 1) Wash and Cut off the largest part of the stems. 2) Blanch by plunging them into boiling water for 1-2 minutes. 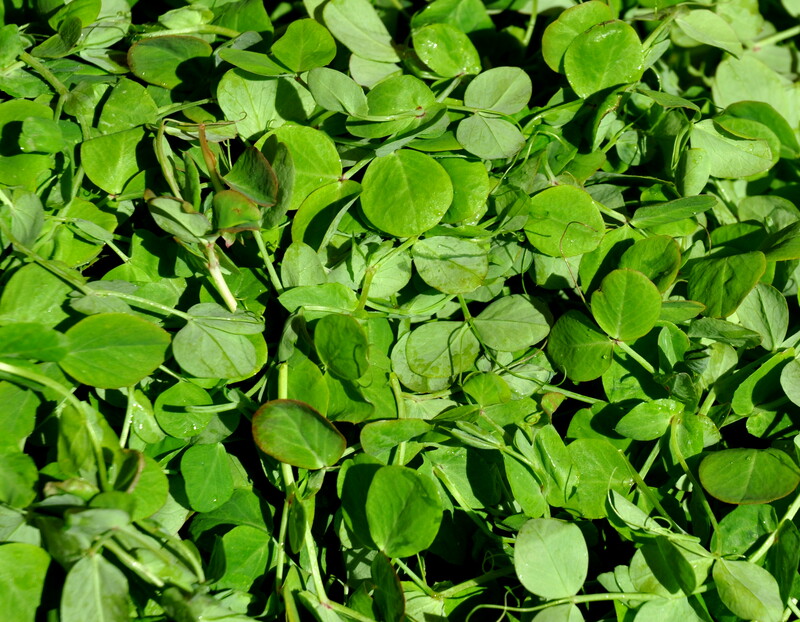 3) Fill large bowl with cold water while leaves blanch. 4) Use tongs, and remove leaves from boiling water & plunge them quickly into the bowl of cold water. 5) Spin or pat with a towel to remove excess moisture. 6) Place in airtight containers or freezer bags and freeze immediately. They will keep for 10-12 months. 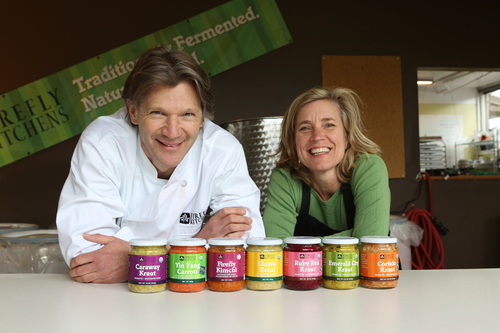 This is a great success story for one of our newer, local food businesses, Michael Pinckney, Owner. Pinckney Cookie Café is a Seattle area gourmet cookie company with a delightfully unexpected offer… cookies that are as moist, chewy, flavorful and as delicious as any that you can bake at home! Containing top quality, dark Belgian chocolate (Callebaut), and many ingredients from local suppliers, you’ll find Wheat, Wheat-Free and Vegan & Wheat-Free choices in many different flavors. And as if that isn’t good enough, you can find Frozen Cookie Dough (wheat only) in scoops that can go right into your preheated oven! A measure of the quality and popularity of Pinckney Cookie Cafe products is that his cookies are now available at the Espresso Stands in Safeco Field. So you can get a delicious cookie even when you’re watching a game. Stop and talk to Michael to ask what he has for his Cookie of the Day.